O'Hagan Desertmartin 11th April 2019 peacefully at Antrim Area hospital Joseph (Joe) R.I.P. beloved husband of Jean and much loved father of Pauline Quigley, Olivia Kelly and the late John and devoted grandfather of Thomas, Michael, Orlaith, Ruairi and Conor and great grandfather of Tommy and brother Paul and Rosemary McIvor. Funeral form his home 24 Inniscarn Rd, BT45 7RU on Sunday 14th April at 10.50 am for 11.30 am Requiem Mass in St Patrick's church Keenaught. Interment afterwards in adjoining cemetery. Deeply regretted by his sorrowing wife, daughters, grandchildren, great grandchild, sons in law Francis and Mark, brother, sister, nephews, nieces and family circle. 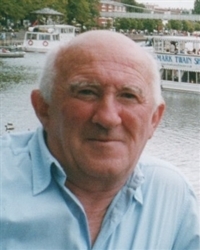 I am sorry to tell you that Joseph O'Hagan (Desertmartin) has passed away.